The 814ce is as beautiful in tone as it is in physical aesthetics. Guided by the design strokes of luthier Andy Powers and the manufacturing expertise of Bob Taylor, Taylor has redesigned its flagship Indian rosewood/Sitka spruce 800 Series, infusing it with a sweeping array of tone-enhancing refinements. The 814ce acoustic-electric Grand Auditorium features V-Class bracing, which enhances sound evenly across the tonal spectrum, produces clear, rich overtones, improves sustain, and highlights the instrument's natural intonation. 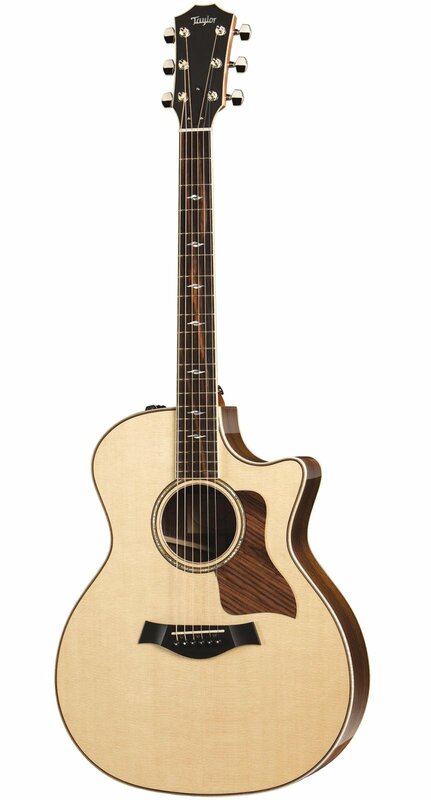 Important features include: rosewood edge trim, an abalone rosette edged with rosewood, maple binding, mother-of-pearl Element fretboard and peghead inlays, a Venetian cutaway, Taylor's ES2 acoustic electronics, and an ebony fretboard sourced from Taylor's own Crelicam mill in Cameroon. Comes with a deluxe hardshell case.